We are back on Friday for more international action. Yaay. We want YOUR footie videos and photos to appear on MOTD Kickabout. Do you celebrate like Dele Alli? Have skills like Lionel Messi or Paul Pogba? Get your parent or guardian to send your photos and videos to us. Northern Ireland manager Michael O'Neill tells Sky Sports: "A good win for us, it was never gong to be an easy and straight forward game. We had opportunities in the first half and the longer the game goes on they would have more belief. But we go the goal in the second half and could have scored a few more. There are a lot of things we are pleased about and some bits to work on. "In the Nations League, our end product was not good enough at this level. We got into the final third a lot but the final ball was not good enough or did have enough men getting across. I have told the players we have to improve on that. "Niall McGinn did well tonight, scored a great goal. I was not disappointed with any of the performance but there is more in us at times. We broke well form midfield and it is nice to get ta clean sheet. "It was a great chance for them but Bailey Peacock-Farrell made a great save, a young boy coming in. "We always have to look for improvements. We dropped the intensity a little and it is hard to keep it going. We came out with the right attitude in the second half." It is a winning start in the European Championship qualifiers for the following nations - Kazakhstan, Cyprus, Northern Ireland, the Netherlands, Slovakia, Croatia, Macedonia, Poland and Belgium, with it ending 1-1 in the match between Israel and Slovenia. World Cup runners-up Croatia come from behind to beat Azerbaijan 2-1. Liverpool's Virgil van Dijk and Georginio Wijnaldum are both on the scoresheet as the Netherlands beat Belarus 4-0. Chelsea's Eden Hazard scores twice as Belgium, top of the Fifa world rankings, beat Russia 3-1. Krzysztof Piatek scores the only goal as Poland beat Austria 1-0. Northern Ireland picked up their first win in nine competitive matches (D1 L7) since beating Czech Republic in September 2017. They have now won their opening match in each of the last three European Championship qualifying campaigns. Estonia have never kept a clean sheet against Northern Ireland in five previous meetings, failing to score themselves in three of those games. 10 of Steven Davis’ 12 goals for Northern Ireland have been scored in home games. Michael O'Neill will have the team in the changing room now with the nutritionist and the sports scientist, they will be getting them ready for Sunday already. All of a sudden the legs are feeling a lot lighter, if you'd have come away from here with a draw you'd be feeling worried about Sunday. Michael and the boys will be on a high. Northern Ireland winger Niall McGinn tells Sky Sports: "We wanted to get the three points tonight and we will dust ourselves down for the next game on Sunday." Quote Message: After the first goal the players blossomed. You could see the confidence. Over the past 18 months we forgot how to win games and the confidence starts to elude you so that's why getting in front was crucial. You could feel it in the stadium, there was such relief. After the first goal the players blossomed. You could see the confidence. Over the past 18 months we forgot how to win games and the confidence starts to elude you so that's why getting in front was crucial. You could feel it in the stadium, there was such relief. Quote Message: Job done. The three points were the most important thing. They stuttered in the first half but by getting Davis and Saville into the game with crosses into the box they got there. You've got to hope that getting the wins gives them a lot of confidence, it might not be the best performance but it's the result that counts. Job done. The three points were the most important thing. They stuttered in the first half but by getting Davis and Saville into the game with crosses into the box they got there. You've got to hope that getting the wins gives them a lot of confidence, it might not be the best performance but it's the result that counts. It ends all square at Ashton Gate. Who impressed you today from the Northern Ireland side? "Sweet Caroline," rings out over the speaks inside Windsor Park. 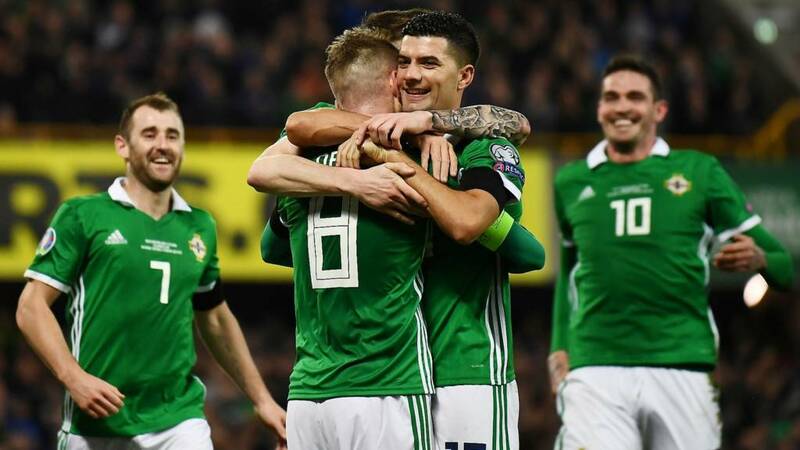 An accomplished Northern Ireland performance ends their winless run and starts their Euro 2020 qualifying group in perfect fashion. Virgil van Dijk has headed in a fourth goal for the Netherlands as they lead 4-0 against Belarus in Rotterdam. Memphis Depay has had a great game, scoring two with two assists, with Van Dijk's Liverpool team-mate Georginio Wijnaldum scoring the other goal. Belgium have made sure of the three points as Chelsea's Eden Hazard has just grabbed his second to lead Russia 3-1. Ajet Shehu: Very unlucky for Kosovo to concede in the 90th minute. A draw is a great result against a very tough Danish side. England we’re coming for you baby! Kosovo, who will be competing in the European Championship qualifying for the first time ever and are in the same group as England, came so close to a memorable friendly win against Denmark. The Kosovans scored first, Tottenham's Christian Eriksen equalised with a penalty, then Swansea's Bersant Celina put Kosovo back in front. However, they were denied in injury-time as Southampton midfielder Pierre-Emile Hojberg scored in the 91st minute to save Denmark as it finished 2-2. Northern Ireland could have had five or six tonight. Sub Josh Magennis has a crack from 25 yards out which is well gathered by goalkeeper Sergei Lepmets. Mags has another chance from the edge of the box, but again it is into the hands of Lepmets. It's been a harder task than Croatia would have imagined, but they have come from a goal behind at home against Azerbaijan to now lead 2-1, with former Leicester man Andrej Kramaric scoring their second goal. Quote Message: The second half has been better. We have seen much more of Saville and Davis and players have gambled and got their bodies in the box. It has paid off. The second half has been better. We have seen much more of Saville and Davis and players have gambled and got their bodies in the box. It has paid off.